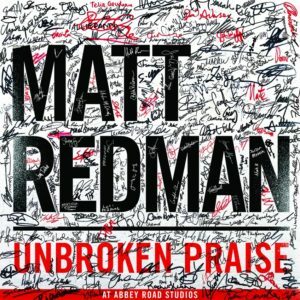 Matt Redman: Unbroken Praise - WorshipFuel by CCLI® - Worship, Music, Copyright ... add fuel to your worship! 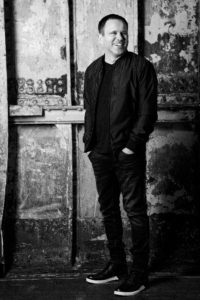 Matt Redman is probably the most influential worship songwriter to emerge from the UK in a generation. His songs have inspired the worldwide church in worship for more than 20 years, winning awards and reaching the most unusual of places. So when CCLI checked in with him as he prepares to release his latest album, Unbroken Praise, we were keen to know how he’s changed, who inspires him, and what he’s learned along the way. Matt, you have a brand new album arriving next month featuring new songs. What can you tell us about it? Well, the new album is titled Unbroken Praise and there are 11 new songs that we recorded live at Abbey Road Studios in London. We invited in over 300 worship leaders and singers, and had a fantastic night of worship there. I hope these new songs will help people stand on truth and sing out strong. Are there particular songs on the album that you think the church will soon be singing? A tricky question! I hope people will find themselves connecting with the songs, and I would love to think that worship leaders might find them helpful in leading worship in their congregations. But it’s always so hard to say which songs might connect most – and time always tells best. Both of your previous albums, 10,000 Reasons and Your Grace Finds Me, were also recorded live. Has that been a conscious decision? Is it something you prefer? What are the challenges and advantages of recording an album live as opposed to the studio? I love hearing the songs really “breathing” on a live record, and I guess if that’s what the songs are designed for (being sung congregationally) then it can be nice to hear them that way. A studio recording on the other hand has more room to be able to hear musicality and detail, so I love recording that way too. But this time around we decided to do another live album – and the idea of that happening at Abbey Road with a room full of worship leaders was hugely appealing. You have written or co-written 3 songs (“10,000 Reasons”, “Blessed Be Your Name” and “I Will Offer Up My Life”) that feature in the current top 25 songs sung by churches in the UK*. The church is hugely diverse, yet so many of your songs have connected universally. What do you think it is about these songs that have made them so popular? It’s so hard to say as there’s definitely not an exact science to the writing of these things. I hope they’re full of truth, and full of heart – and if so I reckon that’s why they would connect. People love to sing, and we were made to sing – so when we sometimes get it right and everything clicks with a song being written, it’s a really special thing to see people starting to own the songs and pour out their hearts through them. One of the key things I’ve always aimed for is to be “simple without being shallow” and I’ve noticed that most of the songs that seem to land best with people have a sense of that – they’re not complex, but at the same time they have some heart, and something to say. Do you, or can you, intentionally write songs for churches to sing? Yes, for sure – although of course they most often start off as an expression of worship from my own heart. I love something Bono once said– “I preach what I need to hear” – and I feel the same about songwriting. First and foremost these songs are usually seasons I’m walking through in my own life, or truths I need to tell myself and express to God. That’s true on this new album as well. If you listen to songs like “Abide With Me”, “It Is Well With My Soul” and “Songs in the Night” you can probably tell my life hasn’t been all calm breezes and sweet-smelling roses this last little while. But then, as well as pouring out our hearts when we write, we’re also very much thinking about writing in a way so that other people can attach their own stories to the songs, and find them useful to sing their prayers to God. A lot of worship artists, especially in North America, have covered your songs. How does it feel when those you might look up to or consider your peers hold your songs in such esteem? It’s always a huge encouragement. I remember when I first heard the ‘country great’ Randy Travis singing “Heart of Worship” – so special. And I was sent a great version of “Our God” by the Brooklyn Tabernacle Choir a while back– which had more energy than our version for sure! But the thing that touches me most is when I hear of the songs showing up in unusual places and people singing them. That could be the backstreets of Mumbai, India, or, as has happened a couple of times, a Hollywood movie. Recently there was a news story of a couple of Australians facing the death penalty in Indonesia for trafficking drugs about a decade before. Even though they were, so I’ve heard, very much reformed, the government decided the penalty still stood – and several news accounts told that in the very moments they were facing the firing squad, they sang “10,000 Reasons.” I can’t imagine a more powerful version of that song being sung. Your first album, Wake Up My Soul, was released at the same time as you were involved in setting up Soul Survivor with Mike Pilavachi in 1993. How has he influenced you on your journey, and how much does he continue to? Ha – a blast from the past! Yes, I had a great journey with Mike P and with Soul Survivor – as you know, he was my youth leader and a huge encourager in terms of me starting to lead worship back then. I actually went back to lead at Soul Survivor last year for the first time in many years, and really loved re-connecting and seeing all that God is doing. Let my deeds outrun my words and let my life outweigh my songs. Soul Survivor has had a huge impact on the church and young people in the UK. Whenever I have asked young people in churches where they discover new songs, Soul Survivor is always mentioned. Did you have any sense that it would be so important and so inspiring for so many young people? No idea at all! What I loved was seeing it grow – year after year. And I love meeting people now who had their lives changed even from back in those early years of that movement. One of the guitarists in my current UK band actually met the lady who is now his wife there when he was in his teens – and another musician we work with a lot became a Christian there – so it’s fantastic to think about all that God has done. The song “Twenty Seven Million” which you recorded with LZ7 reached #12 in the UK chart. How much potential do you see for worship songs to impact the mainstream? Is it important that they do? Now and again it’s nice to see something from the church show up on the charts like that – and especially with an example like “Twenty Seven Million” when it was important to give our voice to this huge issue of combating modern day slavery and human trafficking. What I think is probably more important though is to have the church showing up in every area of society – and on every level. So in this instance that means not just trying to get a band in the charts – but bands down their local pubs and clubs, and people working in all aspects of the music industry – just shining their light in everyday ways. There might be some musicians who are Christians and who become famous, but even if that is the case we don’t need to be putting all our hope on them to be the mouthpiece to a generation. That needs to come first and foremost from the everyday outworkings of our lives – wherever God has placed us. So I love it when I meet people working hard in the cogs of the music industry machine who you might never hear of, but who are affecting the lives of all around them with the love of Christ. Which songwriters have had the biggest influence on you? I’ve always loved the optimism-infused pop of Sir Paul McCartney’s writing. I love also the lyrical genius in some of the USA’s best country music songwriting teams – a good example would be Carrie Underwood’s “Temporary Home” – it’s such a clever story with such a huge sense of heart. And then of course there are lots of my worship leading friends who I’ve learnt so much from by being around them and co-writing with them – people like Jonas Myrin, Chris Tomlin, Jason Ingram, Graham Kendrick and Matt Maher. Love Him, serve His church, prefer others – and just keep taking the next step. It seems there is an increasing trend towards co-writes, sometimes with up to four people contributing to a song. Why do you think more and more song writers are collaborating? What do you see as the advantages and challenges of writing with others? Yes, this has been a huge part of my songwriting approach these last few years. I think God loves us working in “teams” and He’s been kind enough to surround me with some absolutely fantastic songwriters who have a common heart for Jesus and His kingdom. We’re constantly sharpening each other to be better, and cheering each other on. And I’ve noticed that we’re writing a greater number of songs because of that too. Worship songs are obviously influenced by styles and trends in music more generally. What excites you most about the current direction of contemporary worship songwriting? I think it’s great that there are so many songwriters around the world taking the writing of worship music for the praise of God so seriously these days. They’re trying to compose songs that are biblical, relevant, poetic and congregational. It’s not an easy thing – even a word expert like Tennyson said that “a hymn is the most difficult thing in the world to write”! But I love that so many people who I meet are on that quest. It’s a great way to serve our local congregations. In recent years, one of the main challenges has been to try to ensure we go deeper with our lyrical content, and I hope we’re all making some progress in that area too – as it’s so vital in these days. You have a high profile and are looked up to by a generation of songwriters and worship leaders. What are some of the challenges that that brings? It’s probably best summed up in some lyrics from the title song of this new album – “Let my deeds outrun my words and let my life outweigh my songs.” I can be known for being a songwriter and worship leader through music, but if my life and actions don’t complete the integrity of what I’m singing about it, then it’s not a very weighty offering. So that’s the main challenge, I guess. The late John Wimber, the founder of the Vineyard Church movement once said that “the real test in these days will not be in the writing and producing of new and great worship music – the real test will be in the godliness of those who deliver it.” That’s a huge challenge to all of us. What advice would you give to someone just starting out who wants to follow in your footsteps? See what God puts in your hands, and use it for His glory. See what doors God opens, and walk through them with humility. Love Him, serve His church, prefer others – and just keep taking the next step. Matt Redman was speaking to CCLI’s Rich Burrough.